TEHRAN (Tasnim) - Researchers have developed a touch-sensitive skin that took inspiration from jellyfish and can be used to help humans interact with machines. The jellyfish -- a transparent, gelatinous blob that fills the world's oceans -- doesn't inherently seem like much of an inspirational creature. But don't tell the scientists at the National University of Singapore that. 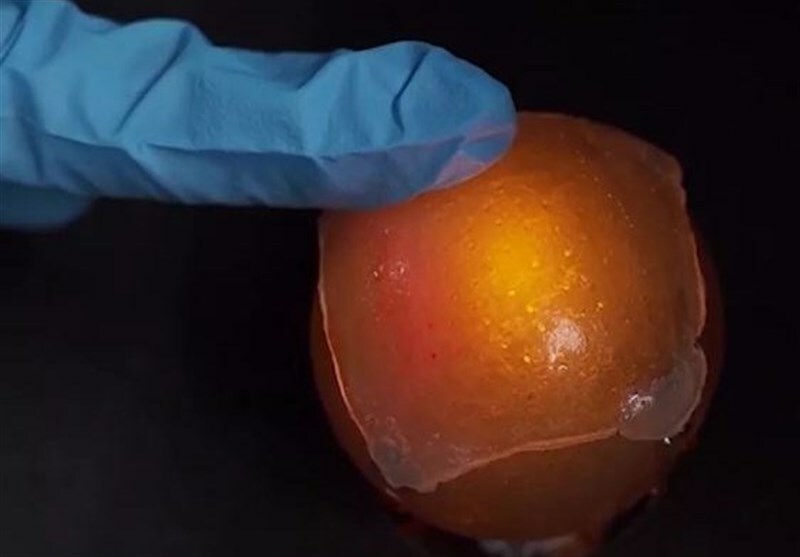 They've been inspired by the humble, transparent invertebrates to build their latest creation: a self-healing, stretchable, touch-sensitive electronic skin that could be used to develop soft robots and various human-machine communication interfaces, Cnet reported. "We wondered how we could make an artificial material that could mimic the water-resistant nature of jellyfishes and yet also be touch sensitive," said Benjamin Tee, lead researcher on the study, in a press release. The details of Tee's new creation were published in Nature Electronics on February 15. The "gel-like, aquatic, stretchable, self-healing electronic skin" is being dubbed GLASSES, for short. By mixing an elastic plastic with a fluorine-rich ionic liquid into a gel, Tee and his research team created a transparent skin that is able to "self-heal" and operate in wet environments, something that previous gels -- such as hydrogels used in tissue engineering -- were not able to do. "What makes our material different is that it can retain its shape in both wet and dry surroundings. It works well in sea water and even in acidic or alkaline environments," Tee said. If the skin is cut or torn, the team demonstrated that it could actively regain electrical conductivity within minutes -- and stitch itself back together within days. Bet that would make the jellyfish jealous. And the material is also conductive, which means that it can respond to touching, stretching and straining. These forces change the electrical properties of the skin and by measuring those changes, the skin could become a viable way to create various sensors that would respond to touch. The researchers suggest this could facilitate new methods of interaction with soft robots, an emerging field of robotics concerned with constructing robots from more malleable and pliant materials than solid metal -- like those used in Boston Dynamics' twerking robo-dog Spot. The researchers showed off GLASSES touch-sensitivity with a simple game of classic mobile game Snake. And a self-healing skin may have positive effects on the environment, too, erasing the necessity for replacement. If we aren't recycling our electronic goods, we are throwing them out -- with more than 40 million tons of e-waste produced each year. Tee sees an opportunity there. "We are hoping to create a future where electronic devices made from intelligent materials can perform self-repair functions to reduce the amount of electronic waste in the world," he said.